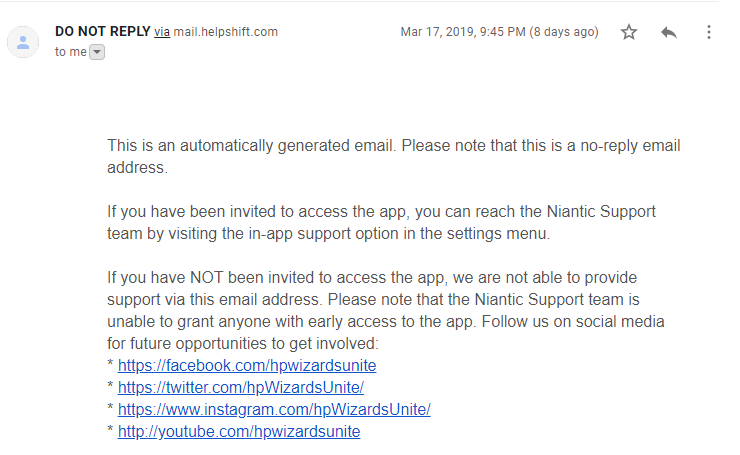 Can Google's pre-registration policy force Niantic to release a Wizards Unite beta (or a full app) before July? First off before I get into this article, I would like to make people aware that if you haven’t already, you can pre-register for Wizards Unite on the Google Play store here: Wizards Unite – Google Play Store. As for iPhone users, unfortunately you are still unable to pre-register at this time, and I have good and bad news about possible beta opportunities. We know, Niantic is slow. However, I come baring possible great news for Android users. Lets dive right into it, shall we? So what does this mean? This means that in some way, shape, or form; we’ll see the game launch within 90 days. Will it be the full game? That might be the loophole. Niantic could roll out the beta slowly to select users, ultimately rolling it out to everyone within 90 days. Now that we know Wizards Unite has rolled out in their studio, and possibly to Niantic sponsors, does this mean those articles that we’ve all been skimming through about game play, are actually true? Only time will tell. Until then, let’s take a look at the terms and conditions for Google Play and pre-registration requirements. Google Play clearly states that you need to launch an app within 90 days of pre-registration. Now, Wizards Unite was available for pre-registration on March 11th. This means that by June 9th at the latest, we should at least see the beta rolled out to everyone – if Niantic observes the official rules. If not the beta, then the full launch. However, this is a weekend, and I don’t expect Niantic to release a game on the weekend. Niantic is known to drop games on a Wednesday, which would be June 5th at the latest. Shout out to fellow WUTuber Gitta Lovegood for detailing that in her latest video. So, if Niantic fails to meet these guidelines, then the pre-registration will close, and they won’t be able to open up a new one. It should be noted that they can still upload the game to Google Play and launch it without pre-registration. While this is unlikely to happen because of how big Niantic is, it’s still a possibility. Now let’s take a look at what Apple has to say for betas, shall we? According to TestFlight, you have to actually upload a beta build and let people download it, in order to use it. So don’t fret! One way or another, iPhone users will get access to pre-registration. iPhone users should look into TestFlight when Niantic actually launches the beta. As always, keep checking back at Wizards Unite Hub for more information regarding everything Wizards Unite! Considering that Google and Niantic are basically the same thing, I think they can skip this rule freely. Huh? Niantic became an independent company in 2015.